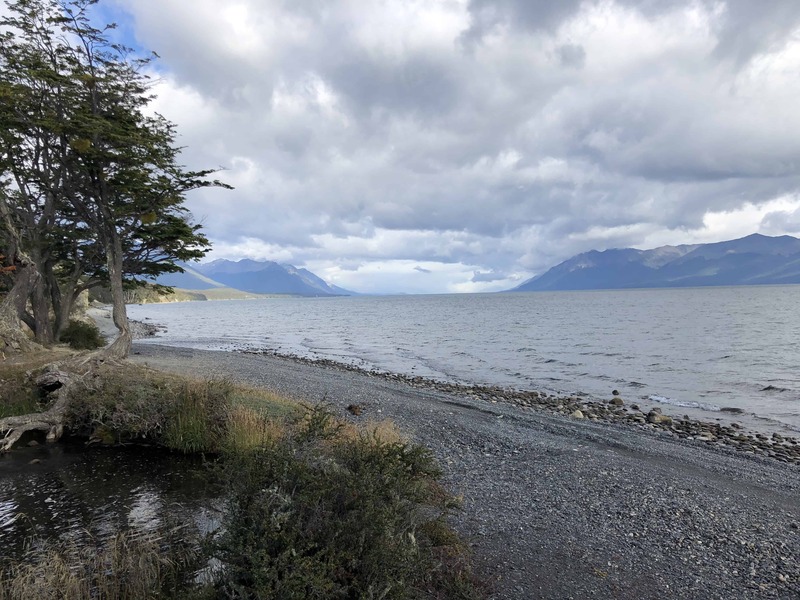 The town is built along the Beagle Channel below the Darwin range, dominated by Cerro Martial and Monte Olivia. Opposite are the peaks of Isla Navarino. The population is about 56,000, with 80% arriving over the last 20 years attracted by duty-free manufacturing and fishing. 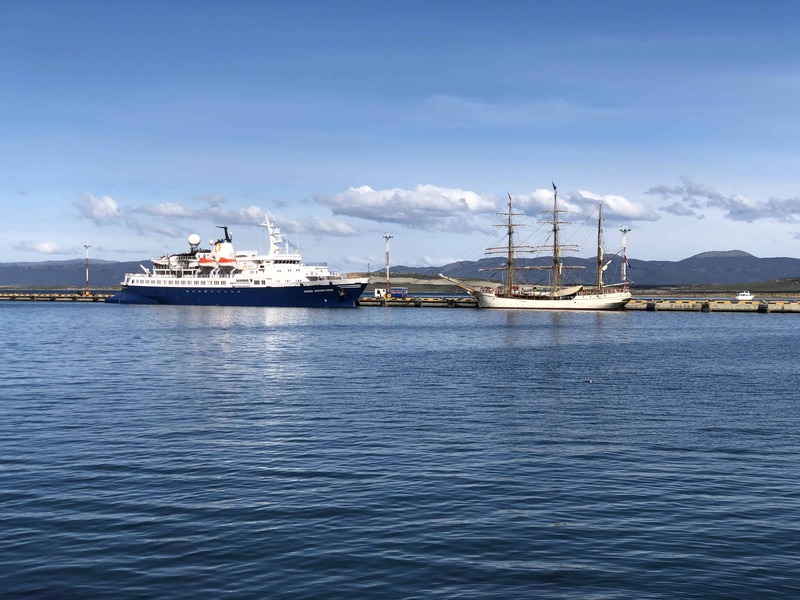 Industry is now declining and there has been a clean up of the waterfront and restoration of some historic buildings has begun, but now tourism is taking over. 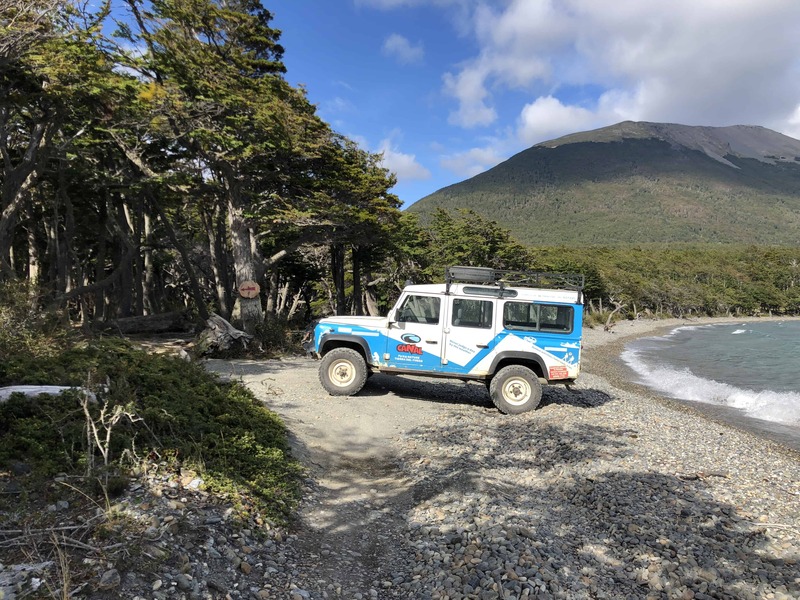 Obviously, given its southernmost location, Ushuaia serves as the jumping off point for most Antarctic expeditions which have been exponentially gaining in popularity over the past decade. 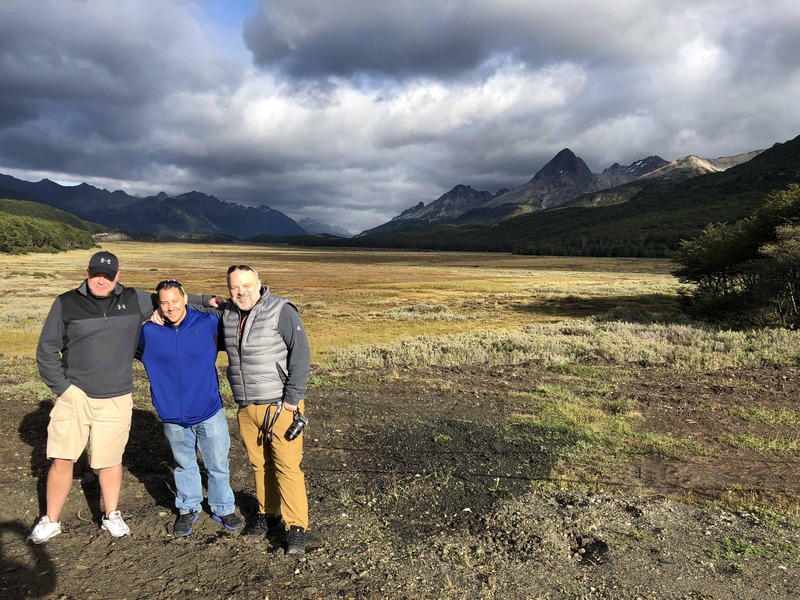 Although we were here for three days, two of them would be for travel so that left one full day to explore. 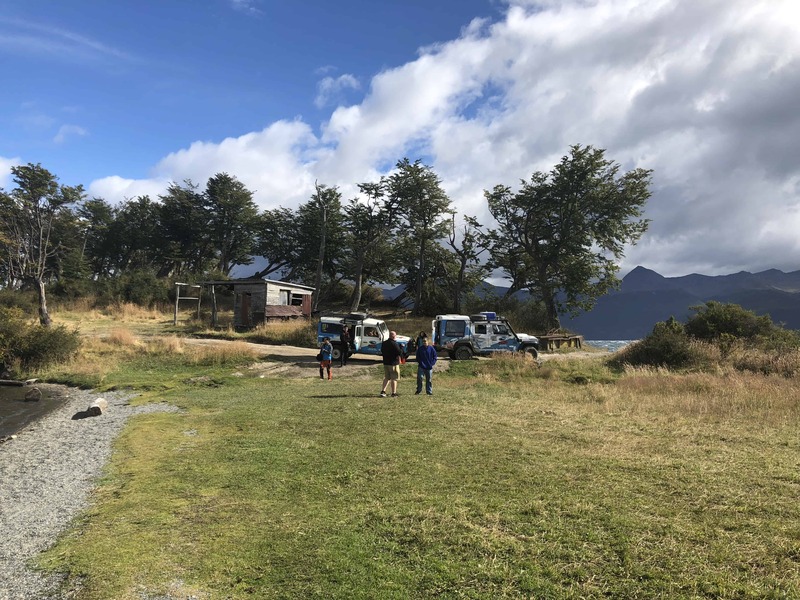 We went online and found Canal Fun & Nature that would take our group out into the Tierra del Fuego wilderness for an off-road adventure. 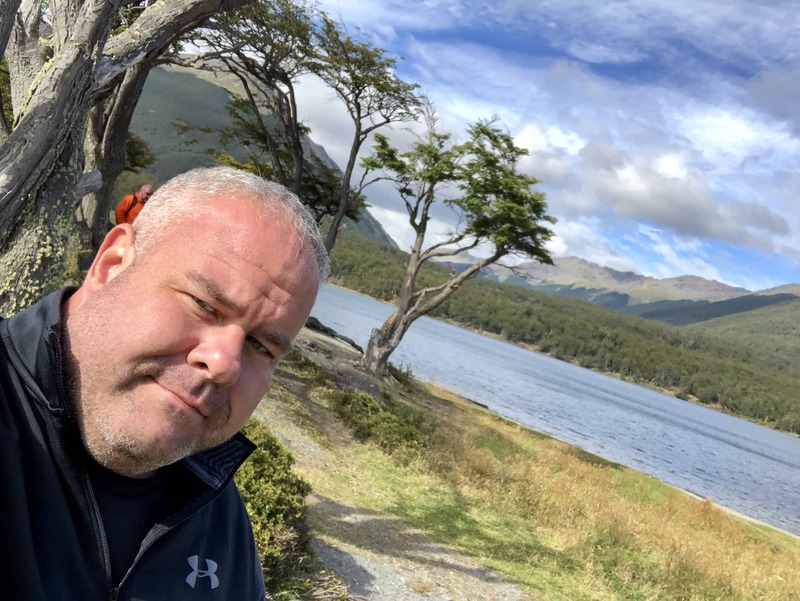 Quick selfie walking along shore of Isla Grande de Tierra del Fuego near the border of Argentina and Chile. 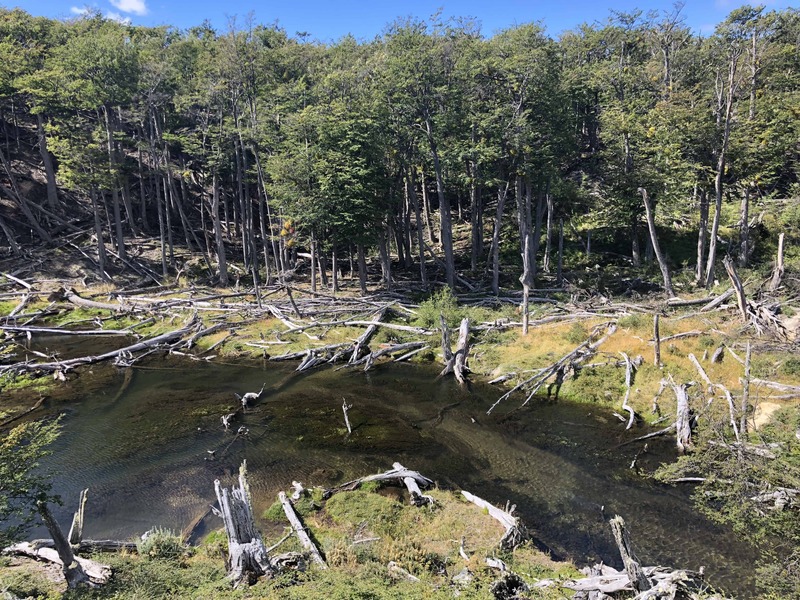 We got to see some of the damage by beavers introduced to South America from North America. In the wisdom that has been repeated worldwide some enterprising soul thought that setting up a fur trade (yes, not a good plan even if it had worked out) in South America was a good idea. So they brought 25 mating pairs of beaver from Canada and deposited them in South America. Not only is the climate so different to where they come from that the fur they produced was worthless, but there are no natural predators so the beavers set to work terraforming the environment, cutting down some trees and drowning others with their dams. Clever critters, in totally the wrong place. There is a now a program in place to eradicate them. After an awesome day touring around, we headed back to the hotel to freshen up and check out the nightlife. It was only a Wednesday night and we were in a small city at the bottom of the world, so expectations weren’t high. 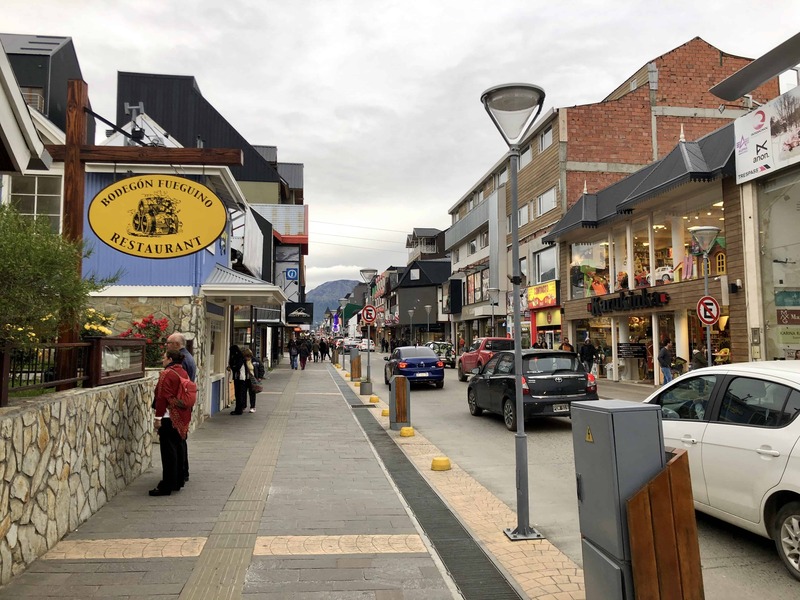 We first found Ice Bar Ushuaia but nobody was there so we left fairly quickly. We walked around and then stumbled upon a place that was packed to the walls with people. 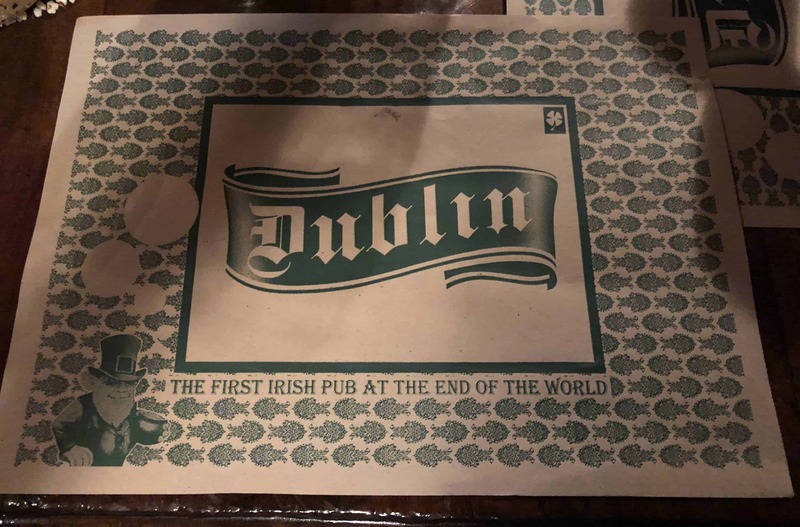 It was, of course, Dublin Pub. You can always count on the local Irish Pub to be packed with people everywhere. There were lots of people there with some good music. Sold! After some decent food and a few more drinks, it was time to call it a night. A quick five minute cab ride back to the hotel and we were asleep by midnight. We had to get up early morning for the start of our expedition. Awakened by what must have been pure excitement, we rushed to pack up and check out the next morning. 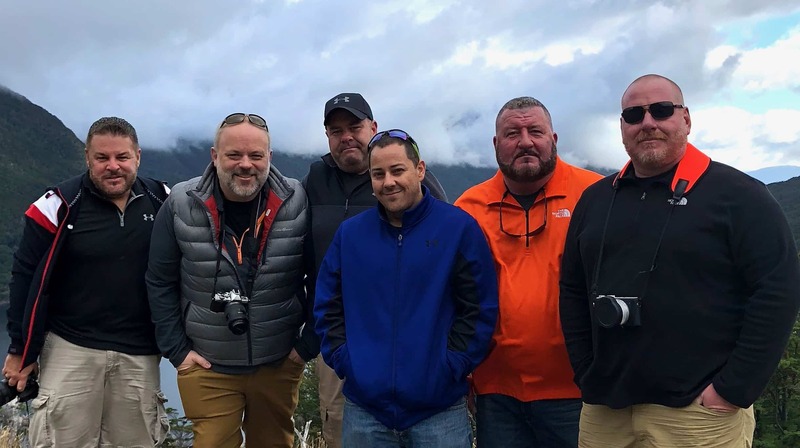 The group met at the Hard Rock, Ushuaia to get some last minute internet and phone calls made. This would be our last moments without any connection to the outside world for a while. And yes, there is a Hard Rock everywhere. After grabbing food and all the internet we needed, it was time to head down to the pier. That’s when I spotted our ship for the first time which had docked sometime early that morning. 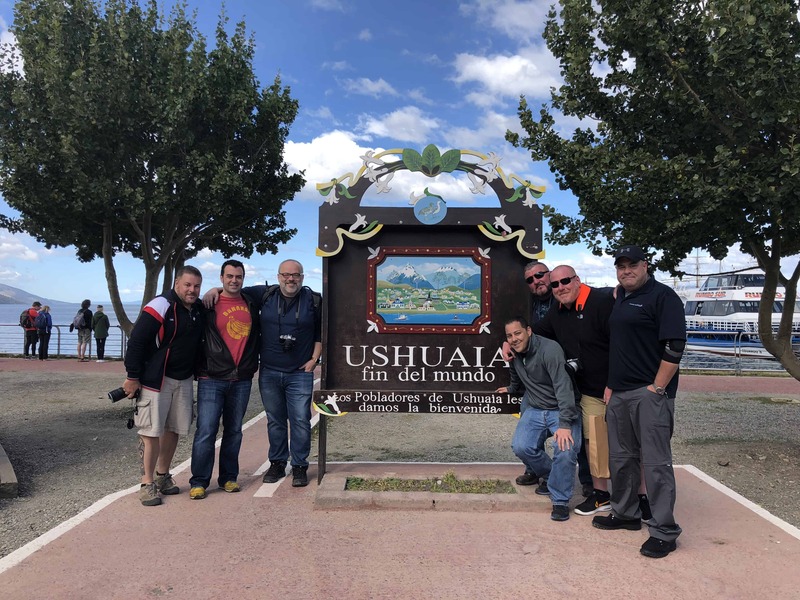 As others were doing, we gathered for a group picture at the Fin Del Mundo (“End of the world” in Spanish) sign next to the pier. This would mark the end of our quick visit to the southernmost city in the world. 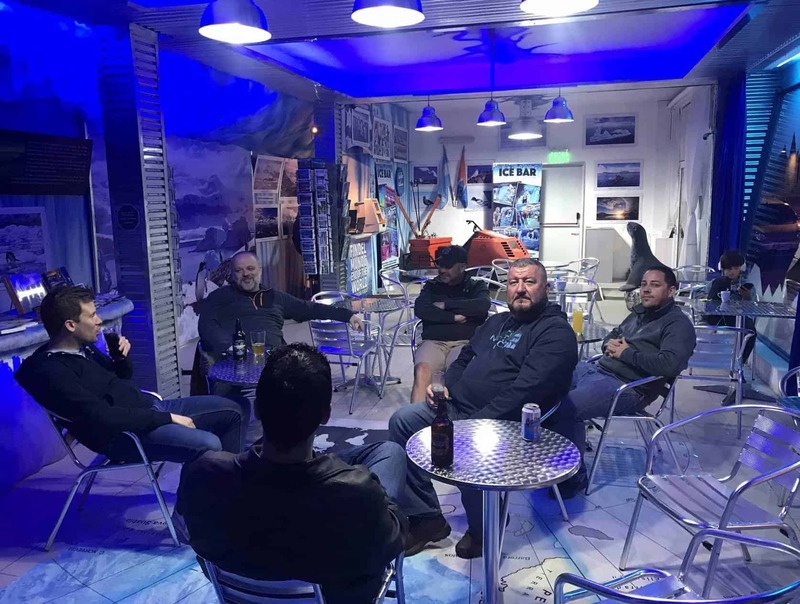 The #Antarctic7: Rand, Ethan, Andy, Jared, Jack, Keith, and yours truly. Thursday, March 1, 2018. The time had finally come. Bags are packed. Ready to go.